I read about a new independent coffee shop in Islington in Time Out a few months ago, but although Islington is easily within lunchtime-reach of my office, somehow, I only got round to checking it out this week. As the Time Out review mentions, Islington has a lot of nice cafes, bakeries and restaurants but there is a surprising dearth of purveyors of fine coffee. 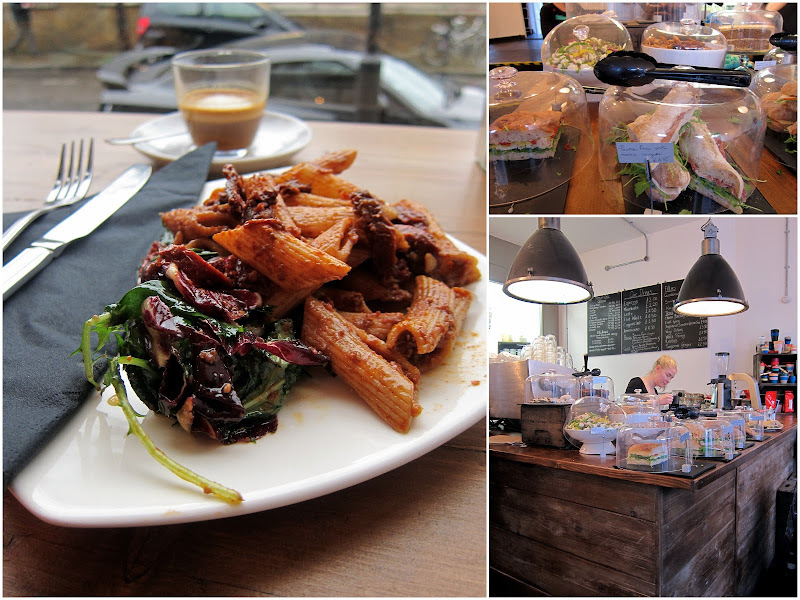 Tucked away, just off Upper Street, on Islington High Street, The CoffeeWorks Project seeks to fill this void, offering a range of coffee drinks (including a couple of different filter coffee blends), and a small selection of sandwiches, salads and even custom cheese-boards from their deli. It's always a good sign when the barista asks how you like your macchiato, and mine came with a dash of milk and a splash of foam, as requested. Too many of the sandwiches du jour contained courgettes, so I ordered the sun-dried tomato pasta salad, which was really tasty and about the right size for lunch. When supplemented with a brownie or a cookie, of course! The coffee was very good too, although I made the mistake of eating the salad first, leaving the coffee section of my taste buds feeling slightly overwhelmed. With its simple wood-heavy decor, CoffeeWorks is also a lovely place to hang out. The window seats are good for watching the denizens of Islington go about their lunchtime lives, but there are proper tables inside too. It makes a calm, chilled-out respite from the hurly-burly of Upper Street, and I'll definitely back for more macchiatos and to check out the non-courgette sandwiches. The Coffee Works Project. 96-98 Islington High Street, London, N1 8EG (Tube: Angel). Website. Twitter.